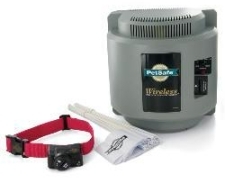 Wireless radio fence containment system for pets weighing 8 lbs or more. Covers an adjustable circular area of up to 1/2 acre. Receiver delivers safe static correction when pet strays into warning zone. Waterproof receiver collar uses 6 volt battery. Setup and training manual included. Wireless radio fence containment system for pets weighing 8 lbs or more. Covers an adjustable circular area of up to 1/2 acre. Receiver delivers safe static correction when pet strays into warning zone. Waterproof receiver collar uses 6 volt battery. Setup and training manual included.